When you’re a kid, decisions are relatively simple: which shirt to wear to the playground after school. Which book to read before bed. Whether to eat your green beans at dinner when they’re warm or the following breakfast when they’re cold. Young professionals, however, get bombarded with many more high-stakes, first-time decisions within a relatively small window of time – and each with much greater long-term implications. Chances are you’ve been around older professionals who are pleased with the decisions they made when they were younger – as well as those who express regrets. The great thing is that when you’re young, time is still on your side. If you make a false start, you have time to redirect. Let’s take a closer look at six crucial decisions every young professional must make to chart a meaningful and successful life and career. 1. How much you want to work. Some fifty years ago, IBM economist Joseph Froomkin predicted that automation – driven largely by the use of computers – would eventually lead to a twenty hour work week and that leisure activities would fill the majority of people’s schedules. Instead, hours for full-time employment have trended upward. Some full-time professionals are able to maintain 40-hour per week schedules, but others work twice as much. One of the first decisions you’ll need to make as a professional is how much time you want to invest at work, and how important your vocational goals are in the greater context of your overall life priorities – and how these may change over time. 2. What profession to work in. Every time I hear someone say, “If you choose a job you love, you’ll never work a day in your life,” I cringe on the inside. No matter how much you love your job, work is tough and brings many challenges. The difference is that when you love your job, you have more energy to overcome the challenges than you would otherwise. As a young professional, there is a good chance you will change careers (not to mention jobs) a time or two over your first decade in the workforce. Just keep in mind that the more you enjoy the work itself, the more likely you will succeed. 3. Where you want to live. Some of us are world travelers and others of us are home bodies. It’s never been easier to relocate for work. As with my own preference for profession, my preference for location has changed over time. When I graduated from college, I couldn’t imagine living in a city other than the one where I grew up. But a tough job market forced me to try out some other cities. Some I liked more than others, and eventually I moved to Dallas where I hope to stay long-term. If I hadn’t been willing to make some of those moves, I wouldn’t be able to work in the profession I love today. There isn’t a “right” way to approach living location. Don’t move to a place you already know you will dislike, but recognize that if you aren’t willing to move, you may limit or delay your opportunities, depending on your profession. 4. What organization you want to work for. The partners you choose will shape your life and career. That includes the organizations you choose to work for. Only 12% of the Fortune 500 companies in 1955 were still on the Fortune 500 list in 2014. As the speed of change increases, shifts in organizational hierarchy will only continue. One of the mistakes young professionals frequently make is selecting an organization to work for without understanding what they truly want from an employer. Oftentimes they focus on pay or brand prestige without thinking about autonomy, opportunities to grow, teamwork dynamics and the organization’s financial stability. That said, the Millennial generation tends to be more in tune with organizational culture and corporate citizenship than others have been in the past. 5. How much education you’ll need. I once heard a colleague boast that he had not read one single book since graduating from college years ago. Another colleague complained that she couldn’t learn to use a new intranet site because she’d never had to do that before. The reality is both individuals will soon be passed up by others who are excited to learn and grow. While recent graduates often feel competent to begin their next career opportunity, many hiring managers proclaim that once they make a hire, the “real” education begins. That even despite the fact that the MBA ranks as the most popular postgraduate degree with over 25% of all master’s degrees conferred. You may periodically find it necessary to obtain an additional degree. But your need for an education will never end. Recording and periodically updating your career and growth goals in an individual development plan (IDP) can help you get there. 6. What kind of leader you want to become. If you haven’t started thinking about leadership by now, it’s time to start. 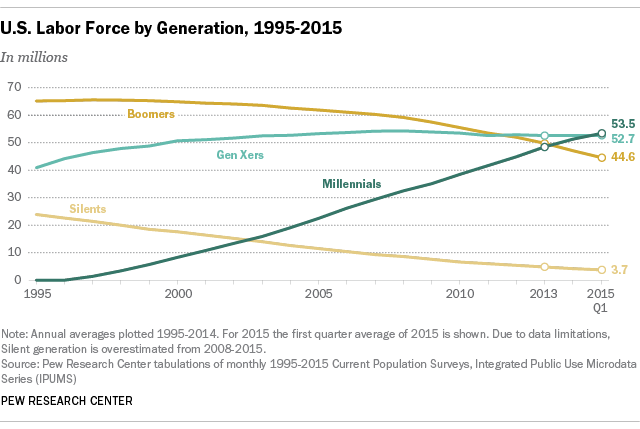 The Millennial generation has been the largest generation in the workforce for a couple of years now. As the Baby Boomers continue to retire in droves, there simply won’t be enough Gen Xers to take their places in upper management. Some Millennials already have. The thing about leadership is, most of us don’t really start thinking about it until we experience our first leadership challenge. Then we’re desperate for help! In his book The Contrarian’s Guide to Leadership, author and university president Steven Sample said that everyone wants to be the leader but no one wants to do what a leader is required to do – namely the person ultimately responsible for success or failure. You don’t need to be a leadership expert to be effective. But perhaps the most important decision you will make is to become a person others desire to follow – and above all, to lead authentically.